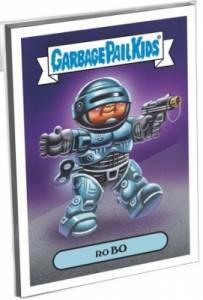 2017 Topps Garbage Pail Kids Fall Comic Convention gives several GPK characters a light-hearted spin using a comic con theme. Offering satirical takes on familiar comic books and television shows, 2017 Topps Garbage Pail Kids Fall Comic Convention parodies known entities such as He-Man and the Masters of the Universe, The NeverEnding Story, and Transformers. 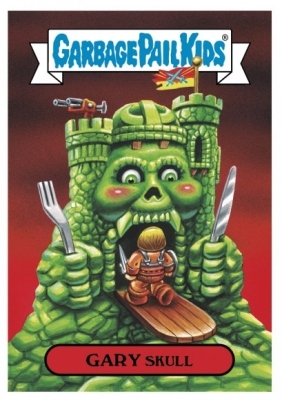 As with most Topps Garbage Pail Kids exclusives, each subject has two title cards that utilize the same image, giving the on-demand set a total of 12 stickers. 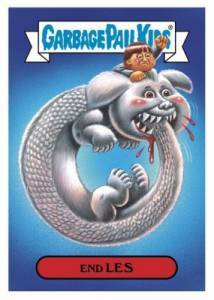 Available only as a complete set for $29.99, 2017 Topps Garbage Pail Kids Fall Comic Convention contains both A and B title cards for all six designs. Collectors may also purchase three complete sets for $79.99. The sticker exclusive is issued directly through the Topps Online Store until October 12. As the 2017 Topps Garbage Pail Kids Fall Comic Convention set is an on-demand release, final print runs will be announced once the sales window closes. 12 cards. Shop for Fall Comic Convention sets at Topps. The titles are different but the images are the same for each subject. 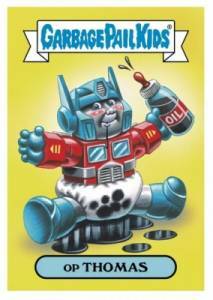 View details for other Garbage Pail Kids exclusives with our related guides.